Are you ready to do more than just "Get By"? 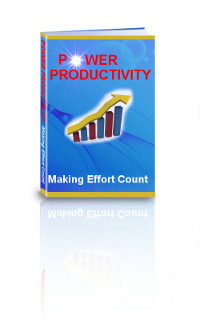 "Power Productivity" will show you how you too can get more done in less time. Is time your friend, or your enemy? Time is valuable - don't waste it! Learn how to keep time on your side with Power Productivity. I am certain that you know people who seem to be able to do anything and everything, and still have time left over. If you are NOT one of them, then you need to learn how to create that extra time with "Power Productivity". Do you wish that you could finally make things happen for yourself? Productive lifestyles are not just a matter of managing your time. You have what it takes, you just don't know where to look. No more leaving life to "Chance"
an average of 2.1 hours every day. A New York research firm found that distraction account for over 2 hours of wasted time every day. Just how much is your time worth? $10, $20, $50 and hour? Even if your time is worth just $10/hr. with a few simple changes. According to Microsoft, most people use less than 60% of their work time. Polls show that 44.7% of the day is wasted on internet surfing. "Great stuff... The formatting and the simplicity of the book made it a pleasure to read and once I began I wanted to finish it. I have now read it twice and underlined lots of things that I feel relate to myself. Great book mate. Thanks." "I read through your ebook in detail. I think you have great content and very useful tips and insights into improving productivity." There is much more to gaining productivity than just managing your time. Creating personal productivity in your life can change your life. "Unlike many e-books that have unnecessary graphics, annoying icons, and numerous hyperlinks, this book’s design is simple and clean. Best part of this book is that it provides you with the most important thing that you need in life - your success." "This is a great little book! It was just enough, yet it didn't drag on. straight to the point. I really enjoyed reading it. I got distracted by my cell phone in the middle of reading about managing my time :) I am going to start using the techniques in your book right away! If it's not for you, we will give you a full refund. and a lifetime of extra time and freedom to gain. Order NOW before this offer expires.